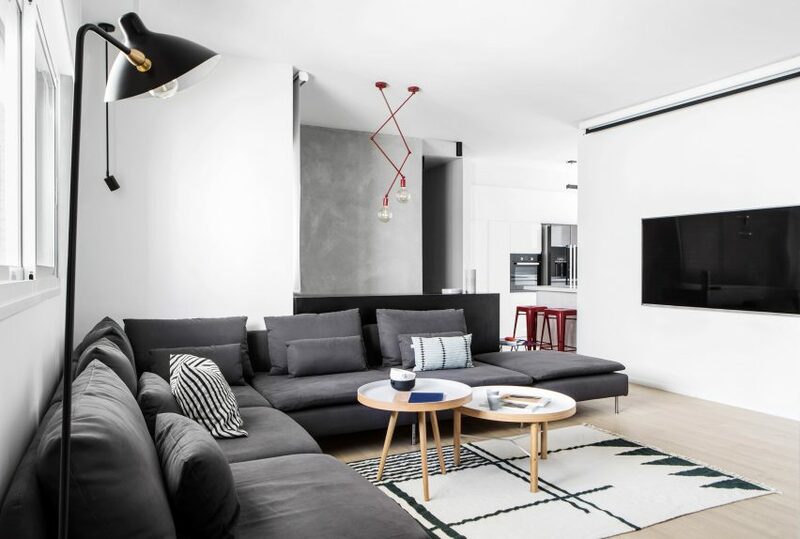 Tel Aviv-based designer Yael Perry renovated this apartment in the Israeli region of Sharon into a “cool, contemporary” space with unexpected colourful accents. 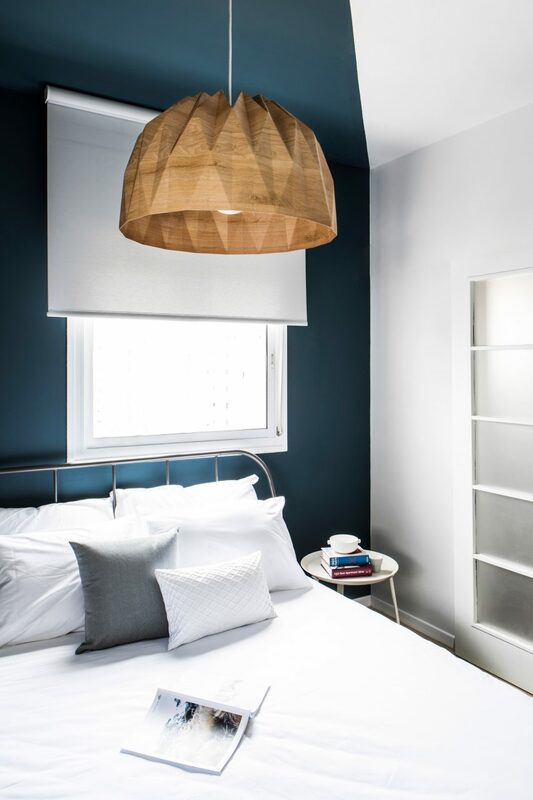 The 240-square-metre duplex apartment has been given a stripped-back colour palette, with walls painted in muted shades of grey and blue. Perry designed oversized geometric shapes for the walls, adding diamonds, squares and rectangles in contrasting shades. This is echoed in other details added to the apartment, including a black-and-white patterned rug, and tableware with subtle geometric prints. Perry covered a wall in the living area with concrete to add an “industrial touch”, and painted the entrance of the apartment in black so both owner and visitors can leave chalk notes for one another. 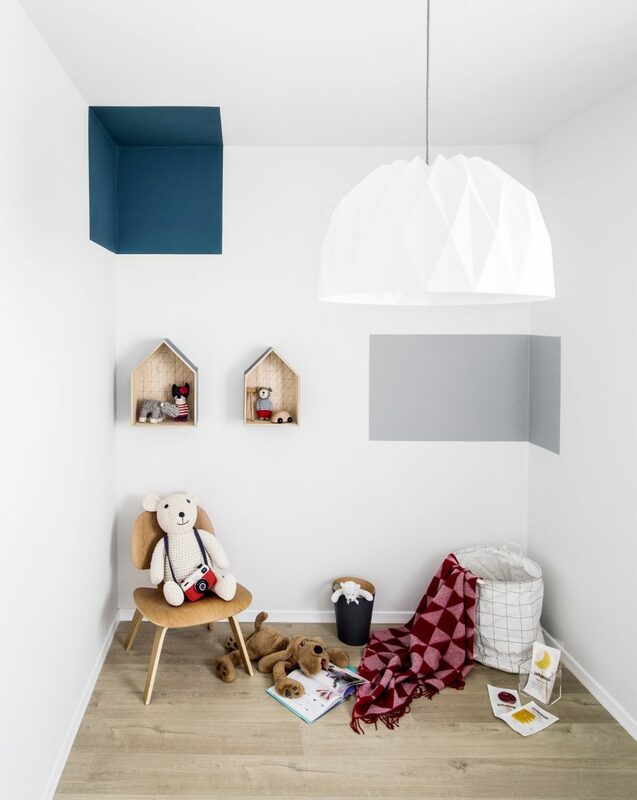 The apartment is owned by a young couple expecting a child, so Perry balanced areas for them to entertain – such as a living area with a large modular sofa and dining bar – with smaller spaces in the apartment, which have been customised as miniature play areas. To contrast the duplex’s pared-back palette, Perry introduced flashes of colour in the form of small pieces of furniture such as bright red stools, a blue side table, and orange office accessories. She also designed lighting specifically for the space, stringing oversized lightbulbs at the end of red cables which crisscross overhead in the staircase. The living space also features a pair of low-hanging lights, suspended on red zigzag metal stems. 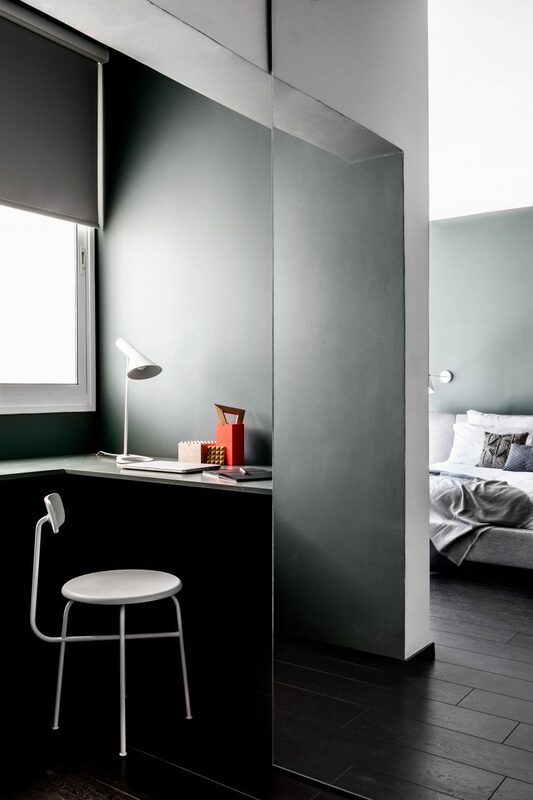 The apartment’s second floor features a master bedroom that is divided from the staircase by a panel of grey glass, and finished with dark green walls and black wooden parquet flooring. There’s also a small niche, tucked into a corner of the bedroom, that Perry has furnished as a tiny office area for days spent working from home. Perry, who previously worked with Karim Rashid in New York, set up her Tel Aviv-based studio in 2014. It focuses on interior design projects for residential spaces. Earlier in the year she also renovated a skinny apartment in her home city, washing it in an all-white colour palette to make the holiday home seem bigger. Vape Joke is a global, multi-platform media and entertainment company. Powered by its own proprietary technology, Vape Joke is the go-to source for tech, digital culture and entertainment content for its dedicated and influential audience around the globe. Vape Joke © 2019. All Rights Reserved.